Hey,guys, do you know what is the date for Halloween? I am sure you have already keep this yearly observed holiday in mind. Yes, it’s on 1st November,2012.Typical traditional Halloween activities include trick-or-treating (also known as "guising"), attending costume parties, carving pumpkins into jack-o'-lanterns, lighting bonfires, apple bobbing, visiting haunted attractions, playing pranks, telling scary stories, and watching horror films. But for me, I enjoy attending costume parties most. Since it’s no more than half an month, we should move to find our costume for this exciting festival. At the same time, you can also find a beautiful free live wallpaper to download for your android phone.Let your little android robot spend the festival with you. This Halloween Live Wallpaper lets you play with pumpkins in the beautiful moonlight evening.You can turn the window lights on and off or make the witch fly across the night sky! Make the bat scream and see the owl blinking! Turn the sound on and off by tapping the moon. Listen to the sound of horror that scares the hell out of you! Don’t you think it's fun! Enjoy Free Halloween Live Wallpaper! Happy Halloween! Welcome to enter the interactive World with hordes of crazy and evil characters. 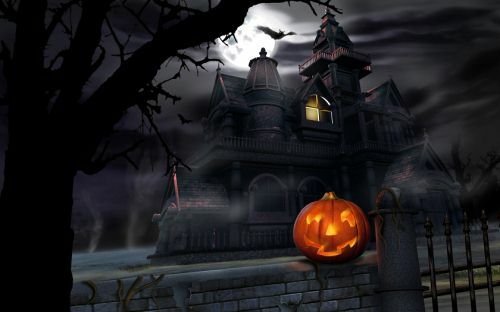 Halloween Live Wallpaper World occupy your device with hordes of crazy and evil characters. Be careful: with these fun Halloween Live Wallpapers, your fingers are sure fell like brush dangerously close to a world where it's always October 31st. A witch, vampire, ghost, and other characters always lurk on your Android screen, reminding you of moonlight, masks, and candy corn,enjoy Halloween 2012! Want to jump in the world in which you’re at a graveyard on a full moon night surrounded by zombies, ghosts, giant bats and bloodthirsty vampires! This is where your nightmare is about to begin! One tip, just put your nerves to this night! Get all the Halloween attributes to your mobile desktop now: evil and kind pumpkins, bats, zombies, ghosts and other freaky spirits. All the freaky monsters are specially animated to scare and entertain you in anticipation of this year’s Halloween. Get scared to enjoy the wonderful gallery of scary wallpapers with interesting Halloween decorations and scary pumpkin pictures that will help you make beautiful carving jack-o'-lanterns. If you have no idea for the coming Halloween, You can use the images of witches as a great idea for Halloween costumes. It will probably be the most popular in the party. Have fun For Your Halloween Holiday!